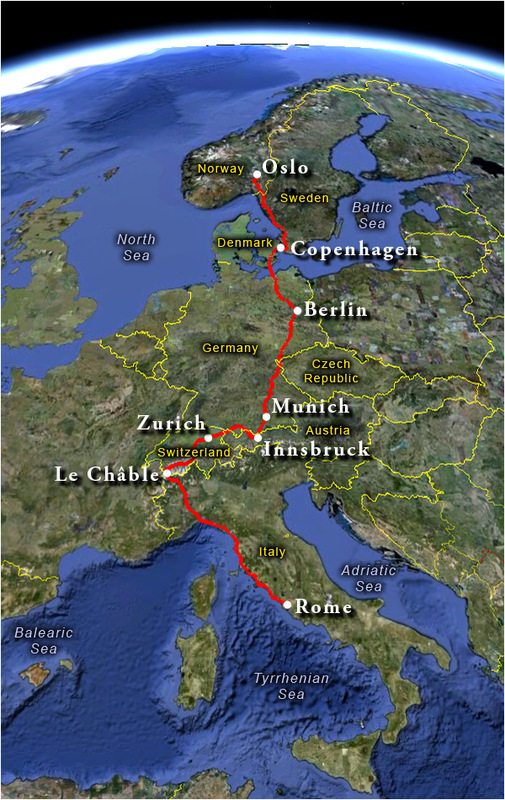 My planned route will take me through eight countries from Oslo, Norway to Rome, Italy, with stops along the way to visit friends in Olso, Berlin, Munich, Innsbruck, Zurich, and Le Châble, a small village in the heart of the Swiss Alps. Total distance: approximately 2,300 miles (3,700 kilometers). Along the way, I’ll be posting daily (or nearly daily – depending on access to an Internet connection) notes, photos, and progress maps. The maps are interactive and will let you follow along the route and see where I am. Here’s an example.